The partnership between Zementis and Teradata allows customers with a variety of data mining tools to efficiently deploy predictive models based on the Predictive Model Markup Language (PMML) standard. 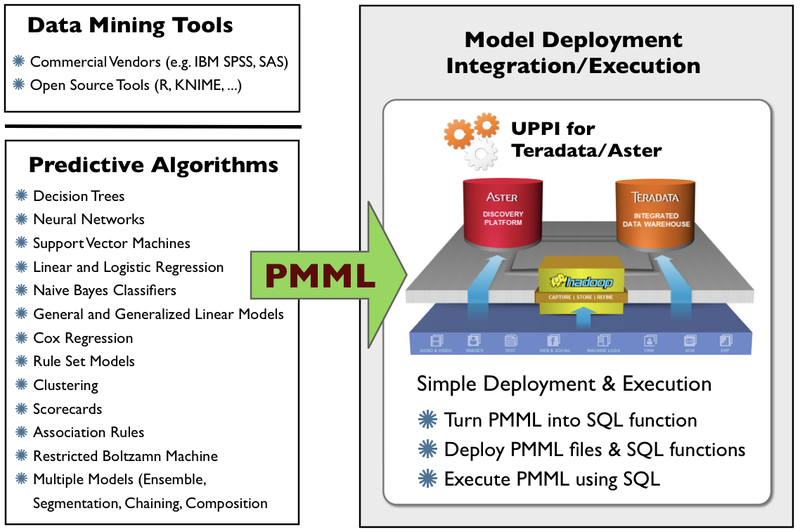 Focused on Big Data applications, the Universal PMML Plug-in (UPPI) for Teradata enables scalable execution of standards-based predictive analytics directly within the Teradata data warehouse. Zementis offers a range of products that make possible the deployment of predictive solutions and data mining models built in all the top commercial and open-source data mining vendors. Our products include the ADAPA Scoring Engine for real-time scoring and UPPI, which is currently available for a host of database platforms as well as Hadoop/Datameer. For a list of available platforms, please visit our in-database products page.